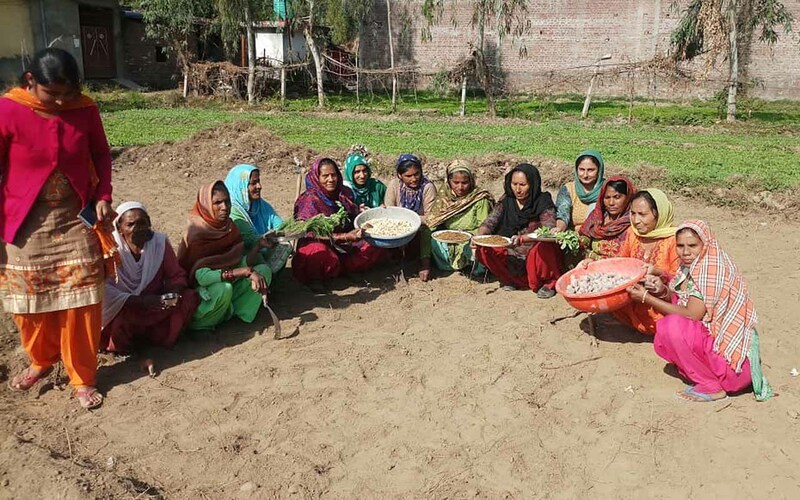 Women in Maira village, Punjab, decided to grow a community kitchen garden. With the help of agricultural program officer, Ghanshyam, village coordinator, Deeksha, and health worker Rani Devi, a huge area of unused land was converted into their communal vegetable garden. The idea of creating a kitchen garden dawned on the women when Ghanshyam described the benefits of growing their own vegetables at a few SHG meetings. Through inspirational stories, he related not only the value of home-grown vegetables for the family, but how working together for the common good built unity and had far reaching consequences. Potato, spinach, garlic, onion, cauliflower, fenugreek, radish and mustard. 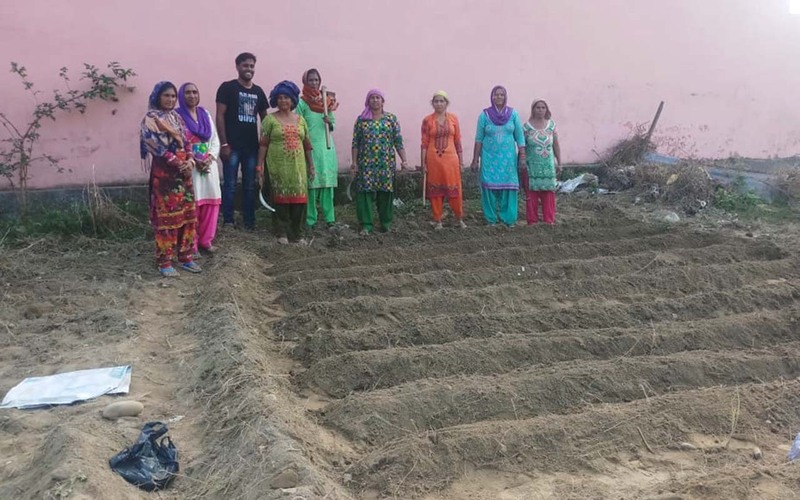 Convinced by Ghanshyam’s charming stories and effort to persuade them to begin a kitchen garden, 14 women decided to embark upon this new quest. An area where nothing had been cultivated for the last 15 years was found and granted by the landowner. The area was so huge that it took five days just to clear it out. After removing all of the thrown-away items and cutting down the perennial plants and roots, Ghanshyam borrowed a tractor from a villager to plough the land. Since the soil was in good condition, there was no need for any extra soil treatment other than leaving the degradable items to compost. After the rain had wet the soil, the land was ploughed once more. All of the seeds found their place in the garden. The seeds, some of which Ghanshyam already had, were chosen according to the season. 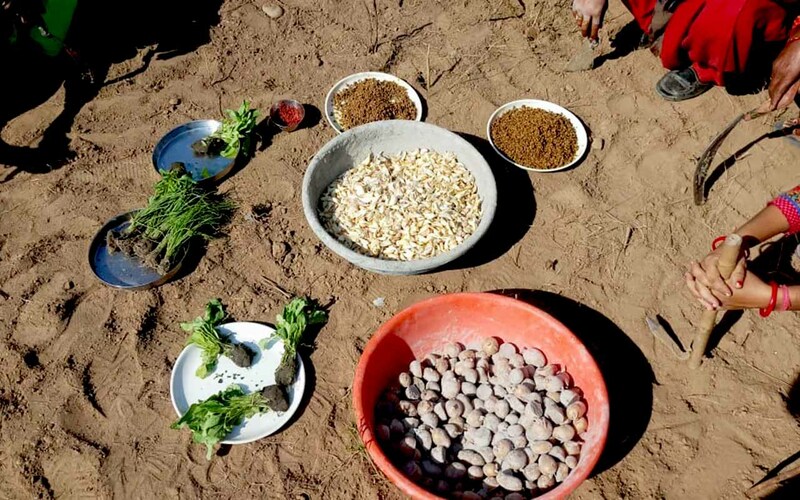 The rest of the seeds, including the winter crop seeds, were purchased in the nearby market in Pathankot. On planting day, 3,328 square feet were prepared for potato, spinach, garlic, onion, cauliflower, fenugreek, radish and mustard plants. After building a series of raised beds, all of the seeds found their place in the garden. 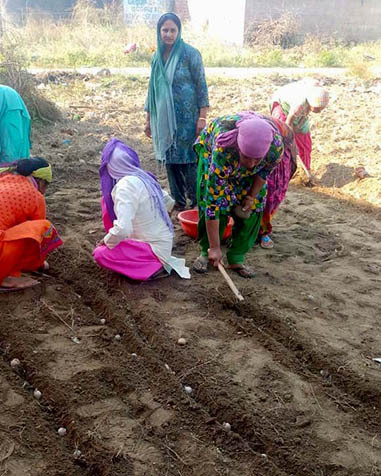 Already experienced with gardening, the women applied their knowledge to the care of the new kitchen garden. Together with Ghanshyam, they formulated a plan to work in pairs and divided the maintenance work into three primary areas: watering, weeding, and harvesting. The whole team of happy kitchen gardeners. The whole team of kitchen gardeners was happy about the effort they had put in for the health and well being of their community.